Naming is an act of power, and Harry Campbell does not hesitate to call out some of the name-bestowers for their arrogance. It may be that sometimes a cigar is just a cigar, or a kiss just a kiss, but a name is seldom just a name. And when it comes to place names, or toponyms as they are formally known, there’s often a story behind the name which offers a fascinating window into the history of the place. If you’re a traveler, even of the armchair variety, you may already harbor a fascination for place names. I know I’ve spent many a pleasant evening poring over maps and gazetteers, remembering where I’ve been and imagining how I’m going to get to all the places I haven’t been. It’s the next best thing to being there, without the vaccination requirements or the necessity of quitting one’s day job. The same goes for historical maps: they make concrete what pages of prose may leave abstract, and allow one to experience the Middle Ages or the Mughal Empire vicariously while still enjoying the comforts of a 21st-Century lifestyle. 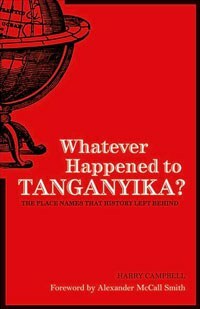 If names like Illyria and Neutral Moresnet and the Islands of Saint Ursula and the Eleven Thousand Virgins pique your curiosity, you couldn’t pick a better guide to the history behind those names (and the geographical regions themselves) than Harry Campbell and his new book Whatever Happened to Tanganyika?. It’s a pleasant little (5”x 8”) volume small enough to pop in your bag and consists of short essays custom-made for browsing. It’s just the thing to take on an airplane flight, if you’re willing to take the risk of being tempted to diverge from your planned journey to visit one of the fascinating places discussed in Campbell’s book, instead. Often name changes are associated with conquest and colonization, but to ignore that aspect would require remaining ignorant of large swaths of human history, and Campbell doesn’t shirk from relating the sad and violent histories associated with some of these names. Take the example of Zaire, now the Democratic Republic of the Congo (DRC). When the Belgians withdrew in 1960 and Patrice Lumumba was installed as Prime Minister, the country was called First Republic of the Congo or Congo-Léopoldville (yes, the city today known as Kinshasa in those days still bore the name of King Leopold II of Belgium, who had treated the vast territory of the DRC as his personal piggy bank). Two coups later, Colonel Joseph-Désiré Mobutu, later known as Mobutu Sese Seko, came to power. One of his edicts outlawed the use of European Christian names, and for the sake of consistency the country was renamed “Zaire” after the Kikongo name for the Congo river and Léopoldville became Kinshasa. When Laurent-Désiré Kabila defeated Mobutu in 1997, he changed the name back to Congo, the “Democratic Republic of” being added to avoid confusion with the nearby Republic of Congo. I’m glad to learn from Campbell that I’m not the only person who thinks of this country as Congo-Kinshasa to differentiate it from the Republic of the Congo or Congo-Brazzaville with which it shares a border. Naming is an act of power, and Campbell does not hesitate to call out some of the name-bestowers for their arrogance. He notes that, “in the bad old days of British colonialism, it wasn’t necessary to be all that famous to have an island named after you”, and cites the case of the Ellice Islands, named after the British merchant Edward Ellice (1783-1863). Ellice owned the cargo aboard the brigantine Rebecca whose captain was the first Western person to “stumble upon” (Campbell’s words) the atoll of Funafuti. In 1962 the Ellice Islands became independent and renamed themselves Tuvalu: they enjoyed a brief window of fame during the Internet boom for aggressively selling use of their Internet domain name (“.tv”) which we are assured will remain valid even if the islands themselves sink below sea level. Campbell gives no credence to the rumors that the name change arose prior to a visit of Queen Victoria, to avoid embarrassing the mother of nine children with a reference to bodily functions. Whatever Happened to Tanganyika? includes a general index as well as indices of people and places. Sadly, there are no maps (if you’re reading at home you’ll want to have a good atlas or Internet connection handy), but the articles do include some nice ink drawings of postage stamps (another window into human history) bearing the names discussed in the essays.